Emprise Services plc, leading support services provider, and Brainwave, children’s charity, on 21st June sent circa 200 people on a 5km treasure hunt around London to raise funds for a child with Cerebral Palsy. Emprise is part of the Brainwave Guardian Scheme through which Emprise has sponsored Chase, a little boy from London who has cerebral palsy, to receive a year’s home based therapy. The Brainwave Walk for Kids proved to be a hugely successful day for the charity after raising over double the target amount. 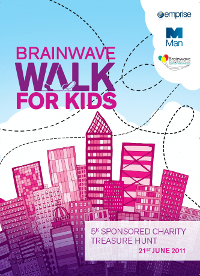 Emprise and Brainwave had aimed to raise enough to sponsor Chase for a further year of therapy but due to exceptional generosity of clients, suppliers and industry colleagues enough was raised to provide two years’ worth of therapy for a child on the Brianwave programme. Main sponsors of this event were Emprise and Man Group. All the money raised will go directly to the children’s charity Brainwave, which develops bespoke home-based therapy and exercise programmes for children with developmental delay and other disabilities, and has Centres in the South East, South West and North West of the UK.